Bartlett’s Familiar Quotations has gone digital. Download our quote app today to begin exploring an unparalleled collection of 20,000 quotations spanning 5,000 years. For more than a century, Bartlett’s Familiar Quotations has been an indispensable resource for quotes for scholarly and casual readers alike. Along with our newly updated 18th edition, we’re proud to announce that — for the first time — Bartlett’s Familiar Quotations is available as a searchable and shareable app. Think you know Bartlett’s? Play Trivie! Now featuring Bartlett’s Familiar Quotations. Introducing Quoto™ — share your favorite quotes in style. Discover your favorite quotes on the Bartlett’s Familiar Quotations app, then use our quote/photo feature to share them with the world! Test your knowledge of familiar quotations. Challenge your friends! Who knows the most quotes? Share this question and keep playing! 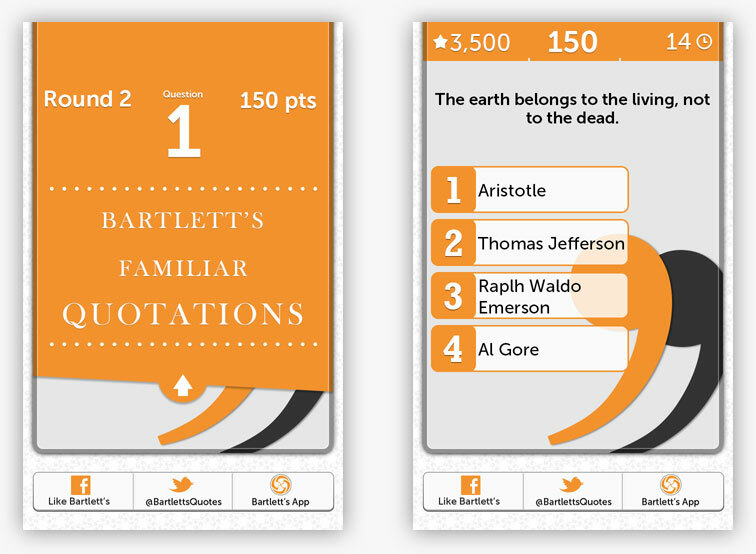 Thanks for playing “Who Said That?” Want a fully searchable and shareable edition of Bartlett’s Familiar Quotations? Download the app! Download the Bartlett’s app to explore 20,000 quotes. Challenge your friends to see if they know #WhoSaidThat? More than 150 years after its original publication, Bartlett’s Familiar Quotations has been completely revised and updated for its 18th edition. With thousands of new quotes chosen for their literary power, intellectual and historical significance, originality, and timelessness, Bartlett’s is a more valuable resource than ever before for the lover of language and literature.